Durable as most toilets are, they all must be replaced at some point. It’s not even uncommon for homeowners to replace toilets that are still in good working order, because there are so many new features and designs to choose from. If your toilet is nearing the end of its useful life — or if you’re just eager for a change — there are lots of options waiting in store. Chances are you have a gravity feed toilet — one with a rubber flapper at the bottom of the tank, which opens up and lets gravity do the work of flushing everything away. But there are a couple of other flush mechanisms to consider. A pressure assisted toilet is a design that uses air pressure to produce a faster, more powerful flush. They’re more common in public toilets, but they can be installed in homes, as well. Pressure assisted toilets stay cleaner longer and are less prone to clogs. They can be much louder than gravity feed toilets and are more expensive to buy and install, however. An increasingly popular alternative is the dual flush toilet, which has both a gravity feed and pressure assisted flushing system. With a dual flush toilet, you can use a water-saving gravity feed flush for liquid waste, or a bowl-cleaning, clog-busting pressure assisted flush for solid waste. No matter which type of flush mechanism you choose, there’s also an option for a cleaner, easier way to flush: touchless flushing. Some new toilets feature touchless flushing right out of the box, but most toilets can be modified with an aftermarket touchless flush system. With touchless flush, users flush the toilet by waving their hand over a sensor. It’s a plus for homeowners who worry about germs, and it can be a big help to anyone who has trouble using a traditional flush handle. There are all sorts of sleek and unusual shapes among designer toilets, but there are a couple of basic design elements that all toilet shoppers should think about before they buy: bowl height and bowl shape. The bowl height of the standard toilet is 15 inches, but this can range from as low as 10 inches and as high as 20. Taller toilets can be beneficial for people with limited mobility, because they reduce the amount of effort it takes to sit down and stand up. If that’s not an issue, and if there are small children in the home, a lower toilet might work well for everyone. Lower toilets can also assist in assuming a squatting position, which is a beneficial posture when it comes to using the facilities. As for bowl shape, there are two main choices: elongated and round. Elongated toilets have an egg-shaped opening and are considered by many to be more comfortable because they’re more spacious. Round bowls may be less comfortable by comparison, but because they take up less space, they’re still used in smaller bathrooms. 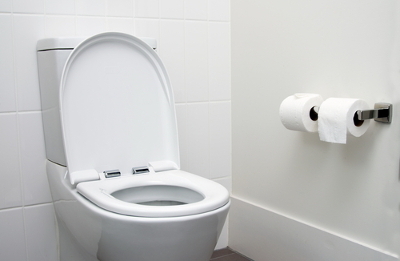 If you’d like to split the difference, elongated toilets come in a variety of lengths that allow you to get the benefits of the oblong shape in a tighter space. Federal standards limit the flush volume of all new toilets to 1.6 gallons, which is a big improvement on older, unregulated toilets that used as many as five gallons of water per flush. But many toilets go even farther than that, and you can be sure that you’re buying a water-saving toilet by looking for the federal WaterSense label at the point of purchase. Similar to the Department of Energy’s ENERGY STAR labeling program for energy efficient appliances, the WaterSense program designates plumbing fixtures that help you save water. Every WaterSense certified toilet uses 1.28 gallons per flush or less. If you want your toilet to be a real conversation starter, you may want to look into smart toilets. Technology commonly integrated into smart toilets includes temperature-controlled seats, bidets and dryers, automatic flush, self-cleaning technology, LED lights and remote controls to use all the sophisticated features. It might be too much toilet for most, but it’s not every day that you get to buy a new toilet, right? If choosing the right toilet is proving more difficult than you thought, or if you just need help installing the toilet of your choice, call up your local Rods Away today. Next Post WHAT’S WATER HAMMER — AND HOW DO I FIX IT?